When you are ready to get rid of your childhood comic books, “Think Outside The Bin” and consider selling them online. Here are several solutions for selling individual comic books, comic artwork or entire collections. The mission at Comic Link is to help sellers maximize their return when selling a collection, individual comic book or comic art. At Showcase New England, they mainly buy large collections and pre-1980 collections. Whether it is just one, or a whole collection, they are interested in paying you for old comic books, hence the name, “Comics for Cash.” They ‘won’t turn you away’ regardless of the condition or type of comic books you have. 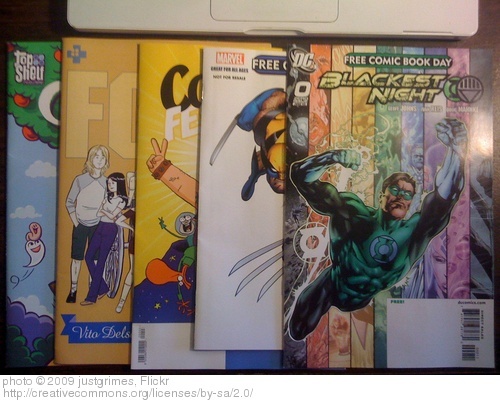 Bid, buy and sell old comic books with just a few clicks at Fantasy Comics. Heritage Auction will provide a confidential evaluation of your entire collection or just a single piece. They are looking to buy directly or accept consignments for upcoming auctions. This entry was posted in Think Outside The Bin and tagged comic link, comics for cash, fantasy comics, Heritage Auction, postaday2011, sell comic books, showcase new england. Bookmark the permalink.